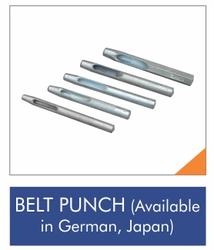 Hollow belt punch set of 7 pcs. In order to suit the various and precise requirements of our esteemed clients, our enterprise is dedicatedly engaged in providing Belts Punch Machines in the market. Multipurpose Belt Punch Pliers, can be used to make holes in belts, papers, etc. 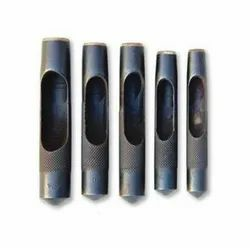 We are one of the noted manufacturers and exporters of Belt Punch Hollow Type, which is developed by following rigid quality management procedures. With its application specific design, this tool effectively drive objects, such as nails, or to form an impression of the tip on a workpiece. We are the noted firm, engaged in offering a wide range of Belt Punch Pliers to our esteemed clients. These pliers are fabricated using heavy gauge pressed steel sheet and hence, are widely used for punching holes in leather, plastics and cardboard. Available in all Sizes 2mm to 32mm (1/32" to 1.1/2"
Corrugation Box Punch, flat belt punch.